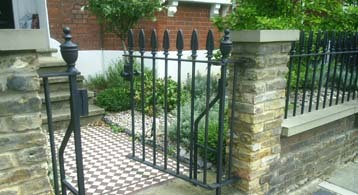 Our bespoke gates and railings can be made & installed to your own design and specifications. Using Mild Steel, Cast Iron, Stainless Steel and even incorporating glass, we can cater for both residential and commercial premises and because all railings & gates are made to order you will always get a design that is unique to you. Residential gates can range from standard mild steel gates to the much more ornate style incorporating railheads and scrollwork. Cast Iron and Hand Forged gates, matching Railings are also available. Whatever the design in mind we can make it a reality. For commercial gates, design may not be as important as security, we can help with design of secure gates including various anti-intruder type devices. As well as the standard stocked security gates such as UltraPale or standard palisade gates we will be happy to design, supply and fit something that is bespoke to you.